If your heat goes out, the best thing you can do is call an expert heating company like Verne & Ellsworth Hann. You may be tempted to use a space heater but there are many facts you should know before using one as a source of heat. 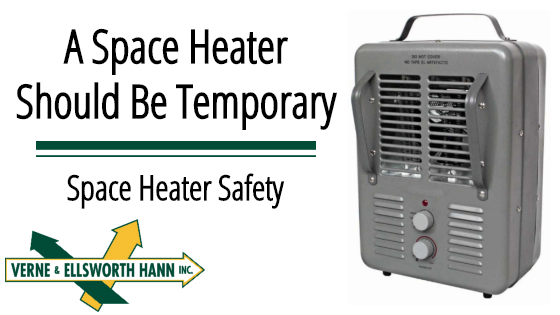 Portable electric space heaters, according to the U.S. Department of Energy, are safe to use in the home, however, while there’s no risk of carbon monoxide, electric space heaters can be a major safety hazard if not used properly. The Consumer Product Safety Commission estimates that more than 25,000 residential fires and more than 300 deaths are caused each year by space heaters. More than 6,000 Americans receive hospital emergency room care annually for burn injuries associated with space heaters. Never leave a space heater running overnight while you sleep and never leave them unattended. Always plug a space heater directly into an outlet. Never use an extension cord. Make sure to place a space heater at least 3 feet away from furniture, window treatments, bedding, clothing, rugs, and other combustible items. Keep space heaters away from water and refrain from using them in a bathroom or a humid basement. If you must use a space heater temporarily, educate yourself about the safety hazards. Verne & Ellsworth Hann, located in Cleveland Heights, is a 5-generation company, owned and operated by brothers Bill and Chris Hann. Homeowners in the Heights and surrounding areas have relied on Verne & Ellsworth Hann for all of their heating, cooling and plumbing needs for over 63 years. 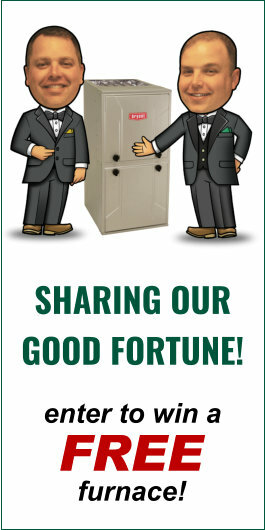 If you find yourself without heat, call Verne & Ellsworth Hann at 216-932-9755 or visit our website at VEHbrothers.com.